Looking across the cleared area in front of a cattle byre (luak), with tethering pegs visible stuck in the ground across the courtyard and two boys sitting on a low mound. To either side of the byre (luak) can be seen a fence presumably acting to help herd the cattle towards the door of the building (see 261). Morton, Chris. 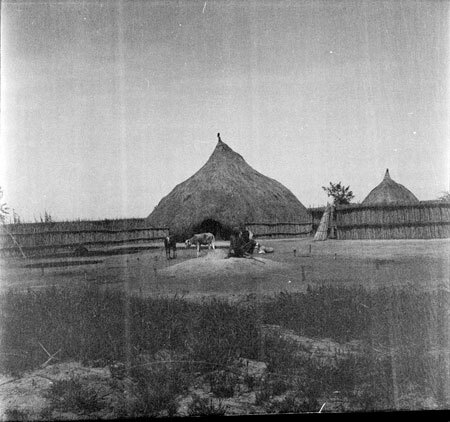 "Nuer cattle byre" Southern Sudan Project (in development). 03 Jan. 2006. Pitt Rivers Museum. <http://southernsudan.prm.ox.ac.uk/details/1998.346.291/>.